142 ships were sold in the first quarter of 2019 to the beaches of South Asia where they were broken under conditions that cause irreversible damage to both human health and the environment.According to a quarterly update from the NGO Shipbreaking Platform, between January and March, three workers have lost their lives and four were severely injured when breaking ships in Bangladesh.On 28 January, according to local sources, Md Motiur Rahman lost his life while working at S. S. Green Ship Breaking yard, located on the beach of Chittagong, Bangladesh. Two Bangladeshi workers were killed Monday in a fire that started in the engine room of an end-of-life tanker being dismantled at a shipbreaking yard in Chittagong, Bangladesh, the NGO Shipbreaking PlatformMd Jamil, 23 years old cutter man, and Bipul lost their lives while scrapping the ship GREEK WARRIOR (IMO 9191412) at Shagorika Ship Breaking Yard. According to local media, Jamil was burned and rushed to Chittagong Medical College Hospital. He died before reaching the hospital. Auditing International Maritime Organization (IMO) Member States to assess how effectively they administer key IMO treaties is an important part of the Organization’s work to ensure its regulatory framework is universally adopted and implemented. IMO’s Member State Audit Scheme (IMSAS) is the subject of a regional workshop taking place in Tunis, Tunisia (2-6 July). More than 30 participants from 13 countries (Algeria, Comoros, Djibouti, Egypt, Iraq, Jordan, Lebanon, Libya, Morocco, Oman, Saudi Arabia, the Sudan and Tunisia) are taking part in the event. Of the 206 ships broken in the first quarter of 2018, 152 were sold to the beaches of South Asia, according to the NGO Shipbreaking Platform.Ship owners continue to sell their ships to the beaching yards despite documented hazardous and even deadly conditions as the prices offered for ships this first quarter have been high in South Asia, especially when compared to the figures of last year. While a South Asian beaching yard can pay about $450/LDT, Turkish and Chinese yards are respectively currently paying $280/LDT and $210/LDT. A Polish sailor told local media that he survived seven months adrift in a broken-down vessel in the Indian Ocean. The 54-year-old Zbigniew Reket said he and his cat survived on what fish he was able to catch and half a packet of soup per day before being rescued near the island of Reunion on Christmas Day. Reket said South Africa was his intended destination when he left the Comoros Islands off the coast of Mozambique in May. He told media he ran into trouble after the mast on his vessel – a modified cruise ship lifeboat – was broken, and strong winds pushed the vessel completely off course. He said he had no means of communication after in instruments on board were smashed in heavy surf. The malnourished sailor was eventually rescued by a yacht crew near the French island of Reunion. The question of how to manage emergency preparedness and response in the oil and gas sector was on the agenda at a workshop in Zanzibar, United Republic of Tanzania (17-20 October). Participants from countries across the East Africa region gathered to highlight good practices in developing national preparedness and response systems, as well as how to improve understanding of risk assessments related to oil and gas development and potential impacts on environment. The group also worked to identify areas for strengthening emergency preparedness and response at national and regional levels. The United Nations Security Council has banned four ships from ports globally for carrying coal from North Korea, including one vessel that also had ammunition, but the United States postponed a bid to blacklist four others pending further investigation. The vessels are the first to be designated under stepped-up sanctions imposed on North Korea by the 15-member council in August and September over Pyongyang's sixth and largest nuclear test and two long-range ballistic missile launches. The European Commission released its report on the viability of a financial incentive for sustainable ship recycling under the EU Ship Recycling Regulation this week. Whilst it acknowledges the benefits for clean and safe ship recycling such an incentive would bring, the European Commission has decided to wait with its introduction. NGOs urge the EU to take action now as it is well documented that ship owners will with ease be able to circumvent the EU Ship Recycling Regulation by simply swapping the flag of their vessel to that of a non-EU State. There were a total of 210 ships broken in the second quarter of 2017. 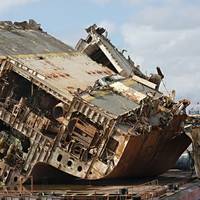 158 of these ships ended up on South Asian beaches for dirty and dangerous breaking, said NGO Shipbreaking Platform. The Platform was able to document five accidents at the shipbreaking yards in Chittagong, Bangladesh, between April and June, which led to the death of four workers and the injury of two. Ishaq worked as a winch operator and died struck by a cable at the BBC Steel Shipbreaking/KR yard. This is the second fatal accident this year at BBC Steel. 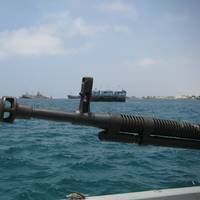 Kenya has become the 13th signatory to the Jeddah Amendment to the Djibouti Code of Conduct – the instrument developed and adopted by countries in the Western Indian Ocean and Gulf of Aden that has been a key factor in repressing piracy and armed robbery against ships operating in that region. Comoros, Djibouti, Ethiopia, Jordan, Kenya, Madagascar, Maldives, Mozambique, Saudi Arabia, Seychelles, United Arab Emirates, United Republic of Tanzania and Yemen are other countries to sign it. Skills necessary in dealing with maritime transnational organised crimes at sea, including, piracy, armed robbery against ships, drug trafficking, marine terrorism and more were at the core of a two-week training course which concluded today in Mombasa, Kenya (22 May – 2 June 2017). The course was conducted under the auspices of the JeddahAmendment to Djibouti Code of Conduct 2017, as a joint initiative between the East African Standby Force (EASF), Nordic Advisory and Coordination Staff (NACS) and International Maritime Organization (IMO). 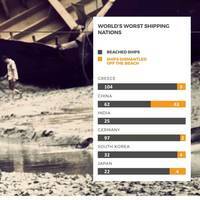 NGO Shipbreaking Platform Annual Report 2016 listed Greece as number one in World's Worst Shipping Nation followed by China. It may be surprising for a country whose industry is proud of green technology and engineering solutions, but in 2016 Germany was responsible for the worst shipbreaking practices amongst all shipping nations when one compares the size of its fleet to the number of ships broken irresponsibly. German owners, banks and ship funds had a staggering 97 ships rammed up on the beaches of South Asia out of a total of 99 vessels sold for demolition.